These 12 half-hour conferences are based primarily on the translations of the first 18 Stigmatine General Chapters. The 5th General Chapter subsequently approved this idea unanimously. 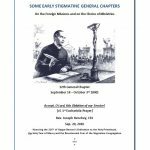 This same approval was reaffirmed by the 7th and 9th General Chapters, a decade or more prior to the 12th General Chapter in 1890 which also almost unanimously approved this wording. However, several of the principal confreres of that era left the Congregation because the interpretation of the word Apostolic “Mission” did not include foreign missions, which were their particular interest. Three of these men left the Congregation to pursue Foreign Missions in Africa. There is a very interesting recent monograph: cf. John K. Goodrich, Paul as an Administrator of the Mysteries of God, Cambridge 2012.